BANGI, 20 Oct 2012- The National University of Malaysia (UKM) can initially generate about RM 40 million from its intellectual property licenses and start-up companies set up to commercialise its research findings. Vice Chancellor, Prof Tan Sri Dato’ Wira Dr Sharifah Hapsah Syed Hasan Shahabudin said the university has to date already registered 573 intellectual property rights, a 287% growth since 2007. Speaking at the first session of the university’s 40th Convocation Ceremony here today, she said its commercialisation effort was bearing fruit as one of them Cili Bangi has even penetrated the international market through one of UKM’s startups, Carotech Sdn. Bhd. A total of 384 people were conferred PhDs at this year’s convocation, the biggest number to date. The convocation which goes on until Tuesday Oct 23 will see the conferment of various degrees and post graduate diplomas to 7561 receipients. Apart from the doctorates, the other recipients are made up of 185 Specialist Masters in Medicine and Dentistry, 2064 Masters, 4,829 Bachelors and 99 postgraduate diplomas and diplomas. 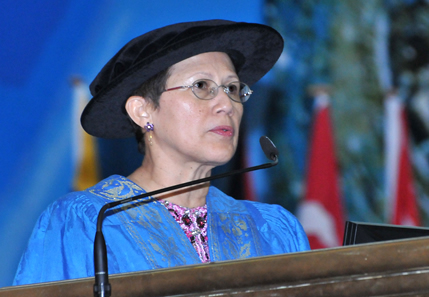 Prof Sharifah Hapsah said various discoveries and strides had been made by its staff which had benefited not only the local community but the world. She gave the discovery by a team of four medical specialists under the guidance of Prof Dr Zainul Rashid Mohd Razi of a method that can protect pregnant mothers from hypertension as one example. UKM programmes were also much sought after by foreign students where UKM currently is hosting 2800 post graduate students from 55 countries representing 30% of all its postgraduate students. Recently the government of Afghanistan has chosen to send 48 of its students for postgraduate studies at UKM after considering other public universities. Its achievements are not confined only to research but in other fields as well. Its team was the 2nd runner up in the “Design and Engineering” category in the Perodua Eco-challenge. In sports the UKM volley-ball team was champion for the 3rd time in the International Invitation Volley-Ball Championship this year in Universiti Teknologi Malaysia while its cricket team also emerged champion in this year’s International Inter-varsity Invitation Championship held in UKM, she said. The university also won for the third time in a row in the Quran reading competition among universities in the country. Present at the Convocation Ceremony this morning was the Chancellor, who is the Yang di-Pertuan Besar Negeri Sembilan Darul Khusus, Tuanku Muhriz Ibni Almarhum Tuanku Munawir; the Tunku Ampuan Besar, Tuanku Aishah Rohani Binti Almarhum Tengku Besar Mahmud; Pro Chancellor Tunku Laxamana Tunku Dato’ Seri Utama Naquiyuddin Ibni Almarhum Tuanku Ja’afar; Chairman of UKM Board of Directors, Profesor Emeritus Dato’ Dr. Zawawi Ismail; Deans of Faculties, lecturers, graduating students and their families.